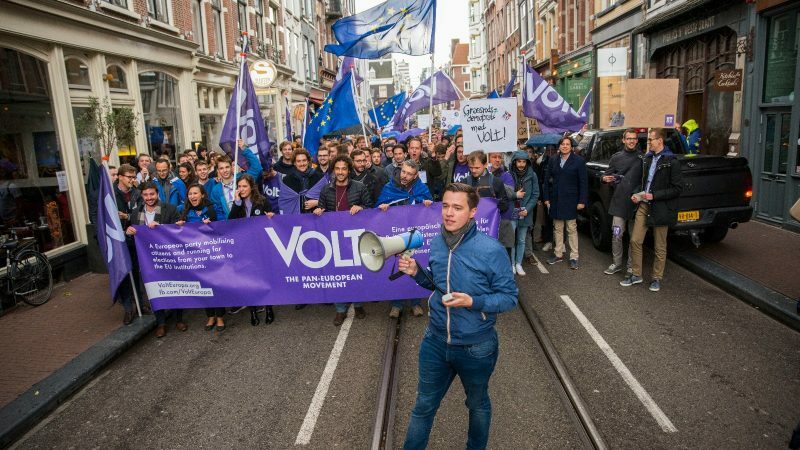 Volt, a transnational movement built by young Europeans, aims to take over the upcoming EU elections with a combination of a hyper-localised organisation and a common European vision. EURACTIV.com spoke to two of its founders. The UK’s decision to leave the EU hit them like a slap in the face. Someone else’s political decision in another country could heavily impact their lives, they suddenly realised. This is how they decided to create a political movement that defends European integration but also advocates deep reform of EU institutions. It all started with a Facebook page put online on the day the UK triggered Article 50 on 29 March 2017, starting the two year countdown to Brexit. Almost two years later, they have more than 15,000 members, 10 political parties already registered at national level and are present in 30 countries, including Switzerland and Albania. Most of its members are volunteers, 70% of them have never been in politics before and so far they have only financed their activity through a crowdfunding campaign. Last week, they held their first general assembly in Amsterdam which over 450 delegates attended. As a result of the discussions, the Amsterdam Declaration was born, a common European programme for all delegations of Volt across the continent. All national representatives of Volt in the member states – EU law does not allow to create European parties that would run at the national level- will campaign under the same message, the same promises, the same objectives. “If you have a common goal, you go together. From Lisbon to Warsaw, our teams are getting ready for this election,” Andrea Venzon, one of the co-founders of the movement, explained to EURACTIV. “Volt wants to go way beyond the European Parliament,” Colombe Cahen-Salvador, also a co-founder, said. “We want to run at every level of government until everything we have in here (she pointed to the Amsterdam Declaration) has been achieved,” she insisted. The party has currently over 300 city teams all over Europe that meet to exchange ideas and discuss on topics of interest. These discussions are then reported to the regional, national and European level. “We are a hyper-local movement,” Venzon underlined. The establishment of these delegations, they claim, allow them to improve the contact with those who would not necessarily be active on digital platforms but also to remain active at the local level, by participating in political activity aside from elections. But even at the level of cities and regions, Volt intends to keep the European vision alive in any case. A lengthy document of over 100 pages, approved in May last year, after an intensive consultation between the members, set out the position of the movement on a wide variety of issues. “When we started Volt, we decided that it should be based on content. I am French and in the last French elections really troubled me the fact that the current president could run without a program for so long,” Cahen-Salvador underlined. The local, regional and national delegations of the party must respect those guidelines when developing their own specific programme while highlighting, of course, the issues that might be more relevant in that particular geographic area. “This means that whether in Ixelles (Brussels) or in a constituency in Bulgaria, we have coherence and consistent positions all across the continent,” she insisted. Volt’s programme puts the accent on the need to deepen the European integration in several areas, including managing migratory flows, harmonising asylum laws, strengthening the Economic and Monetary Union and making the EU more democratic. “We are pro-Europeans, not because we idealise the EU but because it is actually the best means to our goals which are peace, sustainability and ensuring that we have a prosperous society,” Cahen-Salvador said. “We do not only say we want deeper European integration, but we also say we want to reform the EU,” she stressed. Among other things, they want a more democratic, transparent and participative Union; where presidents are directly elected and where the Parliament has legislative initiative, which is currently exclusive to the European Commission. Volt backs Commission President Jean-Claude Juncker’s proposal to make decisions at the Council on the basis of a majority instead of unanimity or consensus and supports Emmanuel Macron’s intention to deepen the Economic and Monetary Union. They also call for a greener economy, and stronger support and protection of workers -particularly those affected by the digital revolution-, more EU funding for education, innovation and research and easier mobility for workers and students across Europe. In a context of increasing racism and anti-migrant sentiment, Volt demands more European solidarity in managing migratory flows, completing the reform of the Dublin regulation – that remains blocked – and ensuring that rights for asylum seekers are the same in all 27 member states. They believe that famine and climate victims should be entitled to international protection under European law and that legal paths for migrants should be made easier. The Common Security and Defence Policy, strengthening the role of Europol, tackling police violence, gender equality and fighting poverty in the more depressed areas of the EU are among their priorities too. “The next five years are going to be highly defining not so much for the European Union but for Europeans,” Venzon argued, not only because the Union is facing numerous challenges but also because politics are changing. Recent elections have been marked by low participation. This, Cahen-Salvador said, happened because people do not understand and therefore do not trust the EU. “This election should be a fight between old ways of doing politics and a new way of doing politics, a new way that is inclusive, in which people participate, in which people have their voice heard,” she insisted. In their first experience in Belgium, with a team of 10 volunteers working for the local elections, they managed to get around 1,5% of votes in Etterbeek (Brussels), the area where the EU institutions are located. For the European elections, they aim to have their own political group – they need representation in 7 different member states and at least 25 MEPs – a tall order. In March next year, they will decide on a spitzenkandidat to represent the movement in the EU elections. The answer to whether or not their alternative to the transnational lists that were rejected by the Parliament will find an echo in the European electorate, will be revealed next May. !!!!YES!!!! Well done you young people! By all its shortcomings the EU also has an astounding track record of 70 years of Peace in Europe after centuries of destruction brought by nationalism. Supranationalism is the only answer.